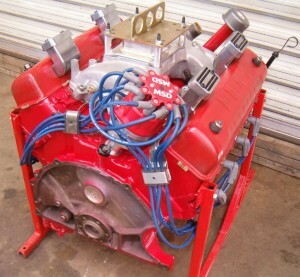 While Glen Henderson’s 337” Y was on the dyno, a variety of two inch tall carburetor spacers were tested. The results were more than interesting and re-enforces why different combinations of parts are tested. The baseline test for this was no spacer and then there were three different styles of 2” tall spacers put into place and evaluated. 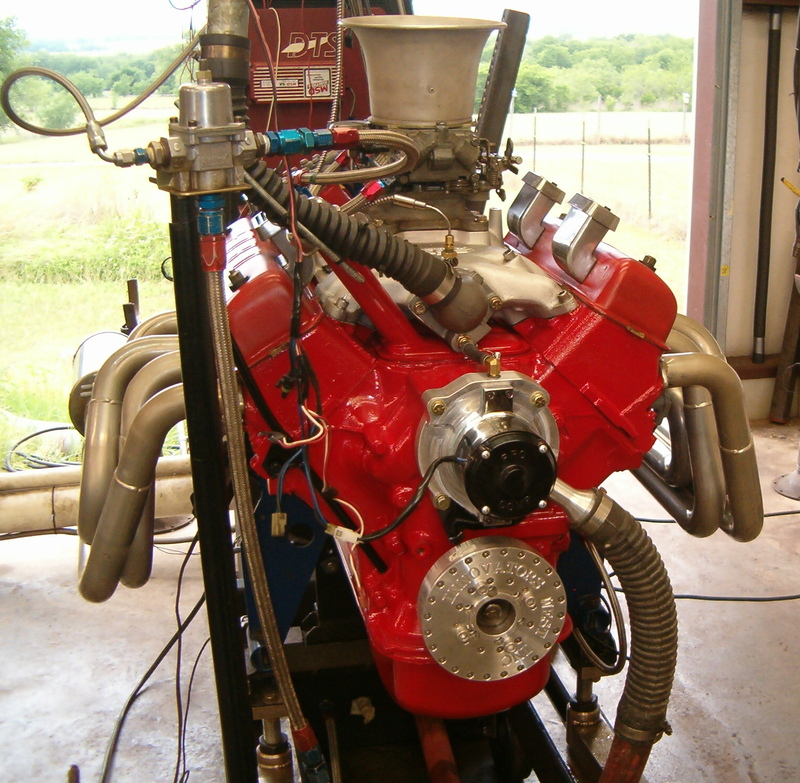 Glen’s basic engine combination is a 337” Y-Block (3.862” bore X 3.600” stroke) using an Isky 505-T camshaft installed at 108° intake lobe centerline (straight up). While the 3.600” stroke is obtained by offset grinding a 312 crankshaft to 2.000” journals, the 312 mains are re-machined to a standard 292 size so this crankshaft can be used in a 292 block. The static compression ratio ends up being 13.2:1 getting there by way of a set of Wiseco 18cc domed pistons and milled/posted ‘G’ heads. A MSD distributor and wire set takes care of the ignition chores while an out of the box Mummert aluminum dual plane intake and a prepped Holley vacuum secondary carb with an 830 cfm center section feeds the fuel to the cylinders. Ignition timing is set at 36° total for these tests. The headers are 1.75” coming out of the heads and then stepping up to 1.875” tubes before going into a 3.5” O.D. merge collector. 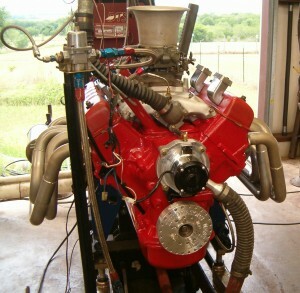 The baseline pull without a carburetor spacer nets a peak of 379HP and 385 ft/lbs torque. The first spacer tested is 2” tall with 4 equally sized holes in it that matches the throttle size of the carburetor being used. This test nets 381HP and 386 ft/lbs TQ. The next spacer tested is 2” tall and has two ovals in it that match the ovals in the Mummert intake manifold. This carb spacer improves performance to the tune of 406HP and 390 ft/lbs TQ. The final spacer in this test is a 2” tall ‘tapered’ spacer. The tapered spacer starts out as a four hole spacer on the top and transitions to a wide open cavity on its bottom matching the outer open dimensions of the intake carb opening. The tapered spacer saw the performance improve again to the tune of 415HP and 401 ft/lbs torque. This spacer test emphasizes just how important the little things are when trying to squeeze that last bit of power from an engine. The best spacer tested showed an improvement of 36 horsepower against the baseline pull using no spacer at all. That’s a very noticeable difference regardless if it’s being used on the drag strip, circle track, land speed racing, or just being street driven. It must be kept in mind that these results were definitive to this particular engine combination and could potentially vary when head flow, camming, intake manifold, headers, or the general tuneup is changed. But this kind of information is always beneficial in giving a good starting point for that next engine build.